On arrival at Srinagar airport meet our representative who will transfer by road to Gulmarg. Meadow of Flowers situated at an altitude of 2730 Mt, Gulmarg famous for its Ski resort during the winters. On arrival check in at hotel and enjoy leisurely walk on the lush green meadows of flowers with backdrop of the snow capped mountains. Optional enjoy Gondola ride (Cable Car). Evening at leisure overnight stay hotel. Today after breakfast time for personal activates & later check out your hotel around 12.00hrs and drive to Pahalgam "The Valley of Shepherds" situated at the confluence of the streams flowing from Sheshnag lake and the lidder river Situated at 2130 Mt. above, rest of the day at leisure to explore the countryside of your own. Evening return back to Srinagar, Overnight stay at the hotel. Breakfast at hotel, time at leisure for personal activates. Optional trip to Chandanwari and Aru of your own, rest of the day at leisure, overnight stay hotel. Today after breakfast time at leisure, check out your hotel on time around 12.00hrs en-route visiting the world famous saffron fields, Awantipora the old ruins (temples of king Awantiwarma) on arrival at Srinagar check inn at houseboat / hotel for overnight stay. Today after breakfast drive to Sonamarg through the Sindh Valley which presents yet another spectacular facet of countryside in Kashmir. Situated at an altitude of 2730 Mt above sea level, Sonamarg "The Meadow of gold" has its backdrop, snowy mountains against a cerulean sky. Optional visit Thajiwas glacier, a major local attraction during the summer months. Evening return back to Srinagar, overnight stay houseboat / hotel. Today after breakfast you will visit the famous Mughal gardens, Shalimar, Nishat, & Chashmashahi gardens known for its beautiful land scrapings and water fountains, while rupturing back en-route visit Kashmir handicrafts centre and carpet weaving factory, afternoon at leisure option personal activates. Overnight at Houseboat / hotel. Today after breakfast on time transfer to airport for onwards Journey. 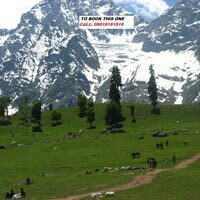 Destinations Covered : Katra, Patnitop, Srinagar, Pahalgam, Son..
Srinagar - Sonamarg - Gulmarg - Pahalgam T..